Simple, quality design at a price that will leave plenty of room for excellent cigars! 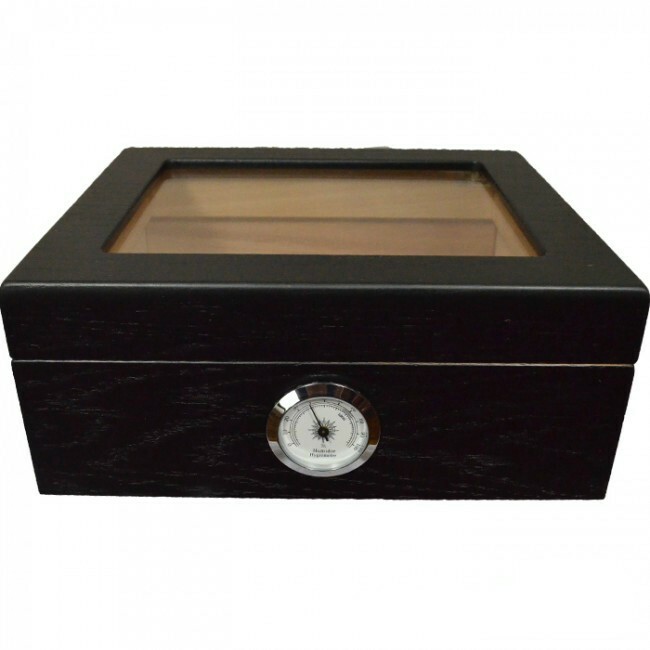 The Onyx Glasstop Humidor is a great value that comes complete with a glasstop lid. Inside, you’ll find a kiln-dried Spanish cedar lining along with SureSeal technology so your humidity stays in as your cigars gracefully age. The Onyx’s black finish is a dark oak color and makes a wonderful addition to any desk or lounge. With room for 2-3 boxes of cigars (50-cigar capacity), you’ll be delighted you added this guy to keep your cigar collection in good shape. Simple, quality design at a price that will leave plenty of room for excellent cigars! The Onyx Glasstop Humidor comes finished in a dark, black oak color and makes a perfect addition to any desktop, bar or cigar room. The Onyx humidor comes securely packaged and is ready to start the seasoning process upon arrival!